Astrophotography is a very rewarding hobby, and you can get started with some very basic equipment. Right now a revolution is occurring in astronomy. You can buy highly sensitive CCD and CMOS cameras from your local mall. When used in conjunction with sophisticated astronomical and digital imaging software these modern cameras can yield results that until very recenty would only be possible for advanced amateurs and professionals. If you own a digital camera you have an excellent tool for a beginner. The advantage with using a digital camera is that it lets you you see how well your photos turned out almost immediately. This is more convenient than having to take your roll of film in for processing and then waiting for it to be developed. With a digital camera you can take a dozen shots, view them in the camera, or on a computer, and be out again under the sky to test something different in a very short time. 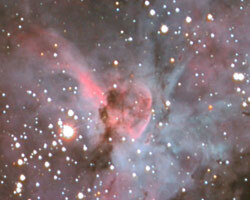 Please don't buy a digital camera for astrophotography until you have researched the matter very thoroughly. This is important because some cameras are a LOT more sensitive than others, and for astrophotography buying the right camera is very important. You should search the internet and ask around for recommendations on the best camera. 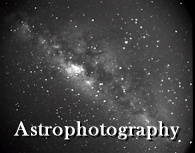 At the moment many astrophotographers consider the Canon DSLR cameras to be excellent value for money (350D, 450D, 20Da, 30D, 40D,etc.). They're not cheap but the results are spectacular. I use a 350D which is getting a bit old now but it is still a great camera. You could maybe pick one up secondhand from a reputable dealer. A sensitive low-cost video camera with a fast (f/2 or faster) lens is a good alternative for a beginner. You can buy a "C-mount" adapter to attach a fast (f/2 or lower) SLR camera lens, which will let you view the night sky live on TV. I've used the Mintron 13V1 for this purpose and I was staggered by the result. The Mintron camera cost me about $US 250 and the adapter $US 40. A 35 mm film camera - one with the "B" (bulb) option for long exposures - is still a powerful tool and must not to be underestimated. For sensitivity, and quality of image, long exposure film photographs still rival digital photography - but this is rapidly changing. Digital cameras are available now that yield similar results to film. In the meantime though if you're on a limited budget consider getting a good condition second-hand 35 mm film camera with a 50mm f/2 or faster SLR lens. Perhaps the fastest and cheapest way to test the waters is to use your existing camera (if you have one) on a tripod or a barn door mount. Using a barn door mount click here. How to build a barn door mount click here. Information on how to get started click here. 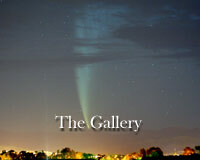 Beautiful images of the Gallery click here. All images and content of this website are copyright (c)2005 Bill Christie. All rights reserved.